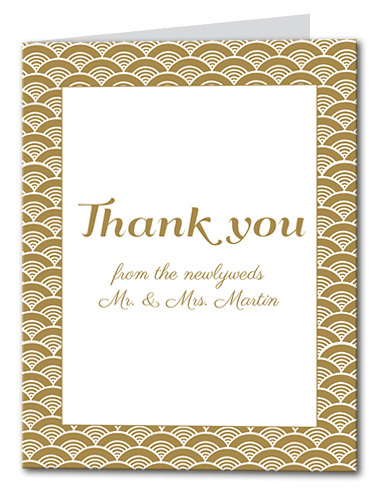 Simple, but intricate in design, our A Festive Event Thank You cards are sure to make an impression on your guest list. A regal gold color scheme combines with an elegant fan backdrop for eye-catching detail that is sure to capture the imaginations of all who behold it. Your choice of wedding font announces your big news in the center, offering a decorative and fashionable contrast. A Festive Event Thank You Card For the best experience, we recommend personalizing your stationery on a desktop computer.